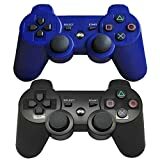 Findway Wireless Bluetooth Controllers for Sony PlayStation 3 PS3 Double Shock (1 Black & 1 Blue) Wireless controller for PS3 is designed for the gamer who demands only the best in wireless gaming technology. High-performance bluetooth controller. Double Shock Vibration. Wireless Bluetooth. 2 built-in motors make the game more realistic Built In Rechargeable battery Turbo fire function Specifications: Color: 1 Black & 1 Blue Weight: 7.3 oz / 190 g Dimensions: (6.10 x 3.74 x 2.36)” / (15.5 x 9.5 x 6) cm (L x W x H) Compatible with: PS3 (You will need your own charger to charge the controller) Package Includes: 2 Wireless Controllers for PS3 Note: 1. It didn’t include the cord. 2.How to do with that fail to connect or other unexpected error? Pls use small screwdriver to stick backhole and reset.if fail again,please reach our customer service. 3. The item would shut off when not in use.